We are delighted to announce the next deVine Club Wine Dinner due to take place on Saturday, April 26, 2014! As you all know, our wine dinners have proved to be very popular with all wine enthusiasts who take this opportunity to come together and enjoy the finest cuisine paired with an exemplary wine list. 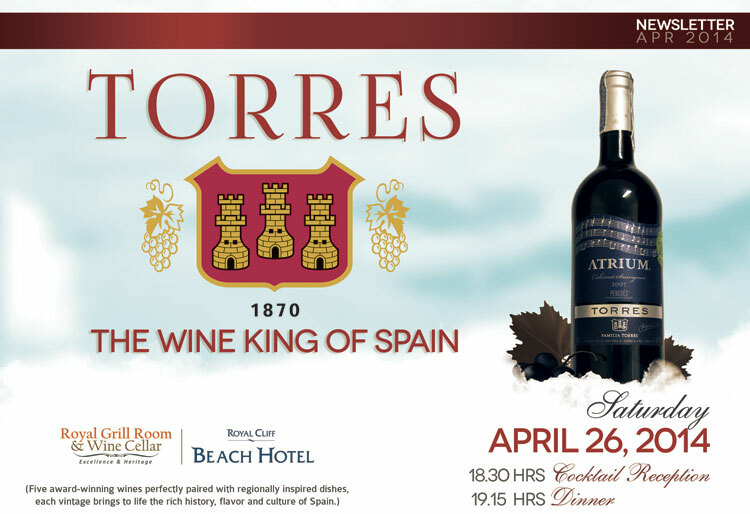 Our upcoming event, "Torres - The Wine King of Spain" Wine Dinner will feature several exceptional Spanish wines carefully selected to complement each remarkable dish prepared by our award winning culinary team. 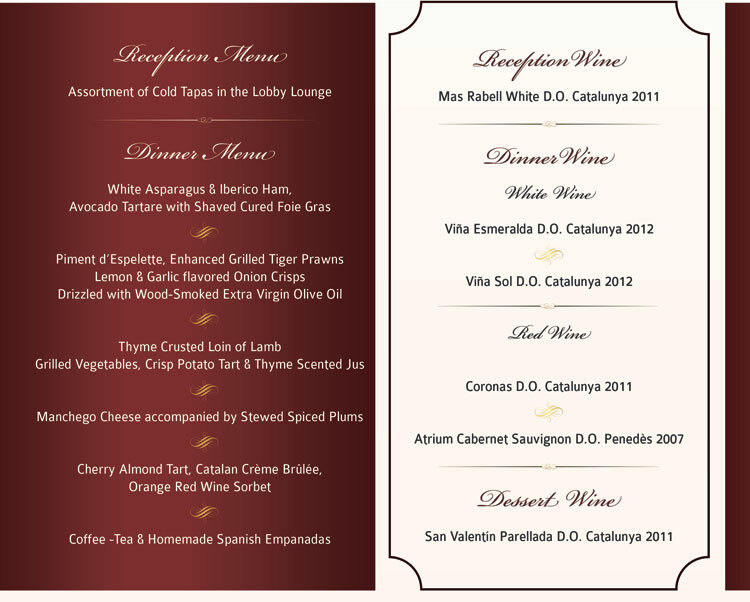 Wine lovers will have another chance to enjoy an excellent 5-course dinner that highlights the delightful taste of Spanish cuisine as well as partake in the rich taste of Torres wines. The harmonious, palate-pleasing combination of a scrumptious repertoire and sophisticated wines will be sure to delight one and all. The evening will commence with a cocktail reception at The Bar of the Royal Cliff Beach Hotel at 18:30 hrs and dinner will be served at the Royal Grill Room & Wine Cellar at 19:15 hrs. Miguel Torres is one of the most famous names in Spanish wine. Four generations after the foundation of the Torres family winery, Torres has produced wines across no fewer than five Spanish wine regions and has created successful wineries in both Chile and North America. With their wines known throughout the world, exported to more than 140 countries and have been acclaimed by wine reviewers to be part of the wine best buys, the Torres name has now been recognized to be synonymous with word "quality". The upper level of special wines produced have consistently won awards at the most prestigious competitions and have been rated in the 90+ scorings by popular wine journals. In the year 2012, Torres was proclaimed the Best European Winery of the Year by Wine Enthusiast magazine. 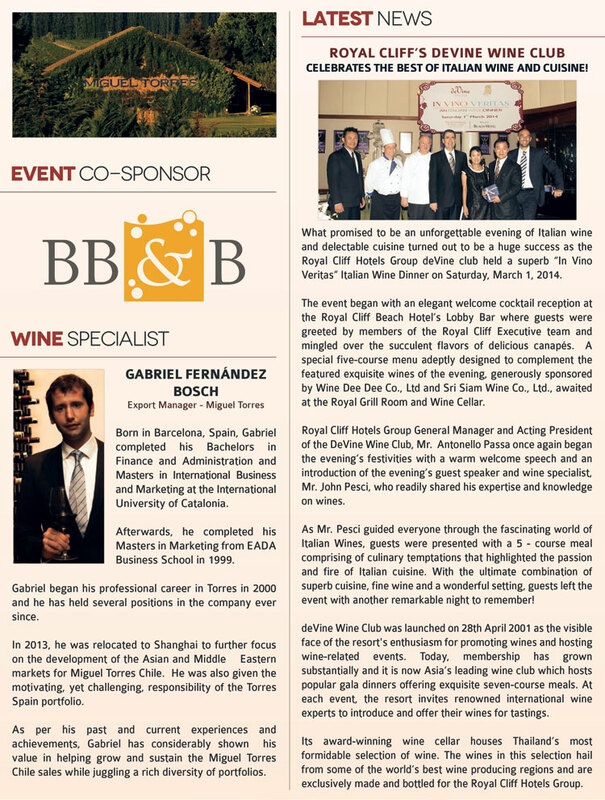 Mr. Gabriel Fernandez Bosch, the wine principal and expert from Miguel Torres in Chile, will be our wine specialist for this evening. Mr. Bosch began his professional career in Torres in 2000 and has held several positions in the company ever since. As per his past and current experiences and achievements, he has considerably shown his value in helping grow and sustain the Miguel Torres Chile sales while juggling a rich diversity of portfolios. I am sure that this will be another unforgettable night to remember. As wine aficionados and valued deVine Club members of the Royal Cliff, we are pleased to provide you with this wonderful opportunity to be able to taste and experience the variety and quality of the famous Torres Wines. Kindly make your reservations early as seating will be limited.